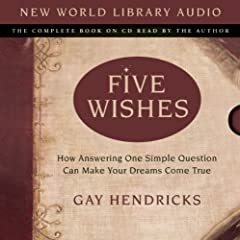 When he was in his thirties, Gay Hendricks was asked one simple questions that changed the course of his life; now he gives readers of all ages and backgrounds that same simple questions, and shows how answering it can lead to wealth, wisdom, and a joyful, fulfilled life. “Who the hell are you, anyway?” said Gay. The man turned out to be Ed Steinbrecher, a well known spiritual teacher and astrologer. Eventually Gay ended up making five wishes and, by framing them the way Ed showed him, they turned into five powerful affirmations that changed the course of his life, and have guided his life ever since. Over the years, every one of his five wishes came true. A chance meeting. Deep questions and a little prodding from a friend Neale Donald Walsch have produced a short, suprisingly simple process that readers can use to jumpstart the power within.